Knockeirka is the 818th highest place in Ireland. 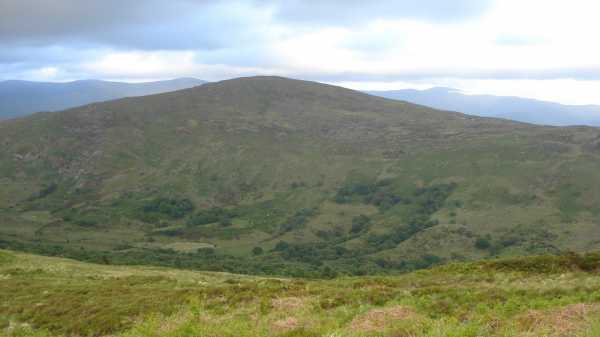 Knockeirka is the most easterly summit and also the second most northerly in the Caha Mountains area. Parked car at V9254 6800 A. Parking easy enough at a sharp right hand turn on road, but maybe only space for one or two cars. Walked along tarred road that ran south, descending 20 or 30m into the valley and leading into a farmyward at V9264 6765 B, with a couple of enthusiastic dogs. Met the owner who helpfully pointed out a route through his land and across a low point in a wire fence to access the mountain behind. Might try and find a route that will not disturb him next time round. From there the going was walking, no scrambling, but as walking goes maybe not the easiest, a few sheep trails ran through patches of rocks and boulders with fern and heather. Went south east from the farm, ascending to about 300m at V9316 6733 C and a fence led from there to the top, though had to cross it. At the summit, lovely views back over Kenmare and across to Knockboy in Cork, and west to the Cahas. Quite remote, few houses visible in the Rusheens and Ballygriffin valleys, but looks like few other walkers have ventured up here, no cairn or mark at summit. It was a little boggy underfoot, might be much wetter at any other time of the year. The southern slopes of the mountain looked easier, would possibly have avoided crossing a farm. Decided to press on almost due west and take in a circuit including Barraduff and Killaha. Time from car to summit was about 40 minutes. There are a number of fences at the top, so moving on in any direction will involve much hurdling.